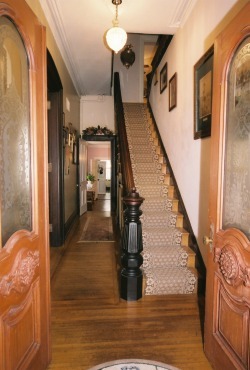 The grand staircase in the foyer outside the parlor is one of two in the home, as seen from inside the parlor here. Note the elaborate carved wood along the edges of the stairs, and the large, solid, walnut banisters that begin at the ground floor and soar all the way to the 4th floor. 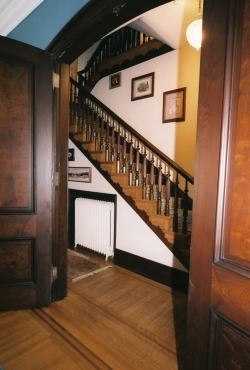 The runner that softens the hardwood stairs was made on a 17th century loom using the materials and techniques of that era. When you visit, you’ll literally see the writing on the wall — left behind in past centuries by previous occupants and recently discovered during renovations.